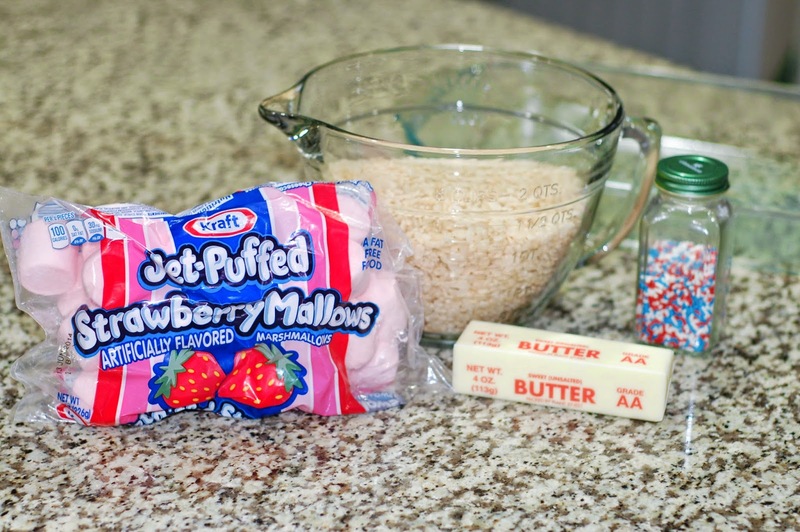 I used strawberry flavored marshmallows for these treats because that's what I had on hand and I like the pick color it gives the Rice Krispies. For the sprinkles, I didn't add them directly into the hot marshmallows because I didn't want them to melt into one color. They did melt a little, but you can still distinguish the reds and blues. For the frosting I used Wilton's Buttercream in a stiff consistency. I used Wilton's clear vanilla to keep the color bright white. Feel free to save yourself some time and buy a can of ready made white frosting if you like. I found red, white and blue Twizzlers Pull n' Peel. I separated out the colors and only used blue and red. I used Cake Mate decorating icing in shimmering red and blue (don't forget to buy the screw on tips). You can also use gel icing or cookie icing. I only ended up using the red Pop Rocks because the blue ones were more of a light green. 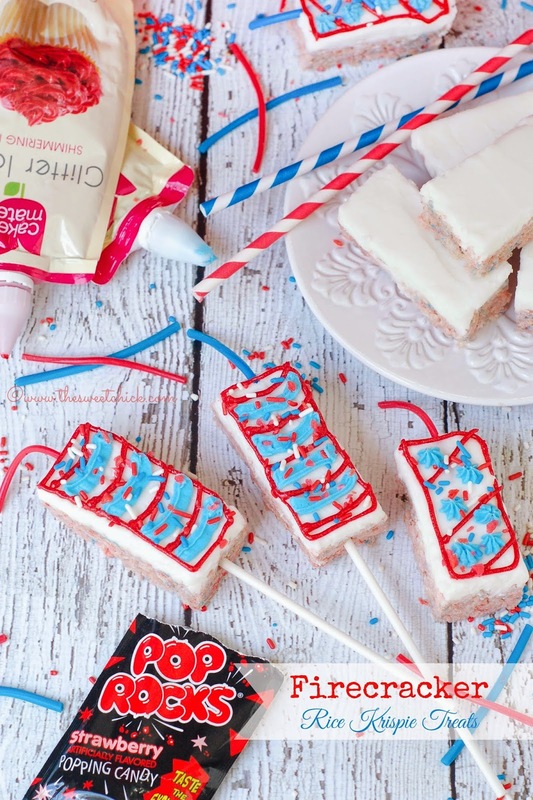 Once the frosting was set and the treats were cut into rectangles, I pressed the piece of Twizzlers into the icing and covered it back up with my fingers. The frosting is pretty malleable at this point. Then decorate however you like and sprinkle with Pop Rocks at the end. You can add more sprinkles too. 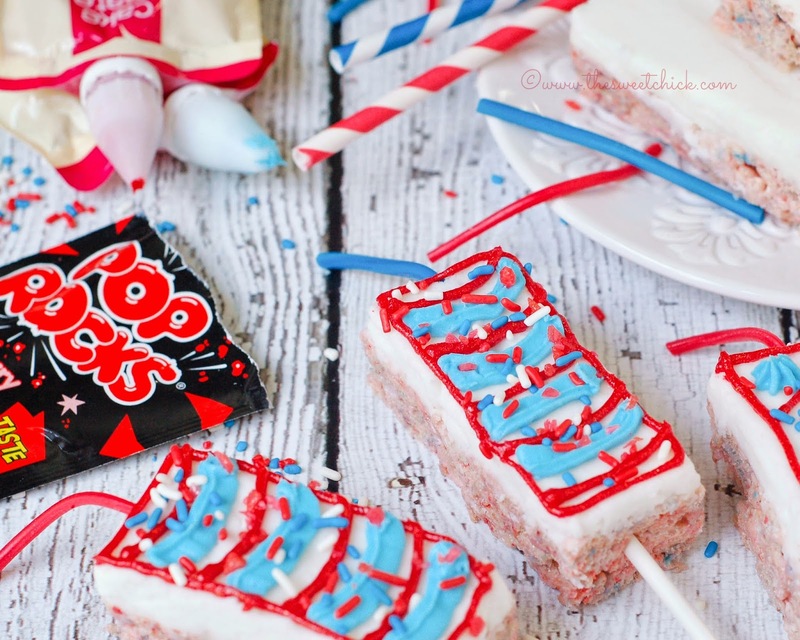 If you are making these ahead of time don't add the Pop Rocks until you are ready to serve because they do react with the frosting and end up melting. You want to make sure they keep their POP. You can add as little or as much as you want. You don't have to add the lollipop sticks, but if you do, you want to do it before you start decorating. And you are going to want to dip the tip of the stick into some melted candy coating before inserting it into the Rice Krispie treat. This will help make it more secure. You can use paper straws the same way. Come on, it's time to get creative! 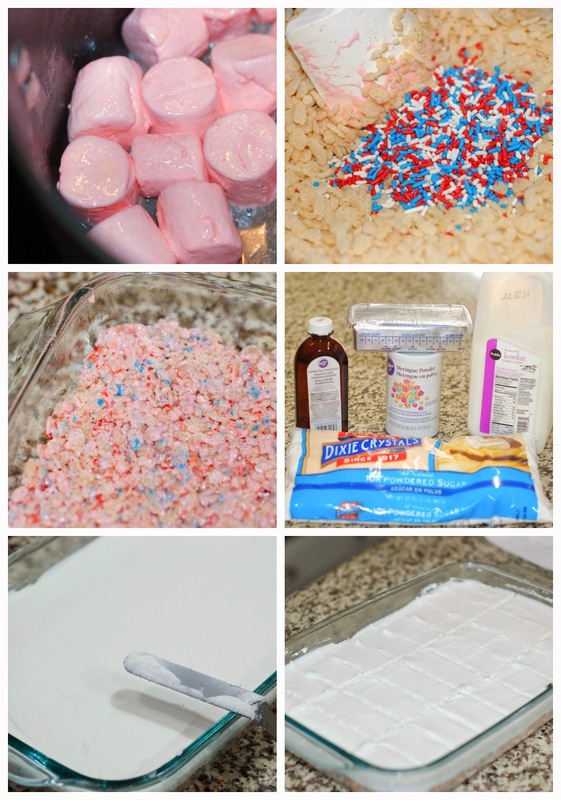 Remove from heat , add the Rice Krispies and the sprinkles. Mix until all is well incorporated. Then pour the mixture into a greased 9 x 13 pan or a cookie sheet and spread it evenly with a piece of waxed paper. In a stand mixer, cream together the vegetable shortening, vanilla, and 2 tablespoons milk/water. Add the sugar and meringue powder and mix on low until the frosting comes together. If the frosting is too dry, add another tablespoon of milk/water. 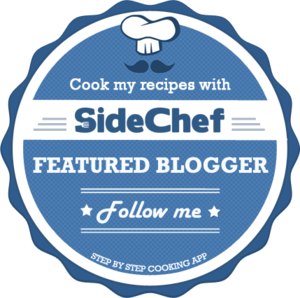 You want the consistency to be smooth and spreadable, but not too thin. With a spatula, spread the frosting evenly over the cooled treats and place back in the fridge to set. Once the frosting is set, cut into 27 rectangles with a sharp knife and remove from the pan/cookie sheet. Take one rope of Twizzlers and cut it evenly in three parts, then take all the strands apart. Separate out the different colors. 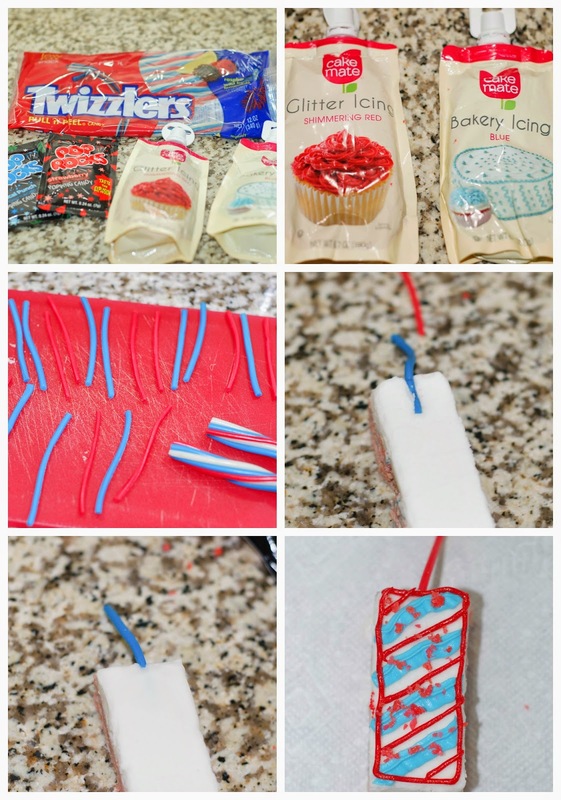 Take a cut strand and push about a one inch length into the frosting at the top of the rectangular treat and with your fingers, gently push the frosting back over the strand to cover it. Repeat for all treats. Then, using the different colored icing, decorate your treats as you wish with the different decorating tips. Add sprinkles if you wish, then add the bits of red Pop Rocks. If you wish to put these on lollipop sticks, do so before you decorate and dip the tips of the sticks in melted candy coating before inserting them in the treats. This will keep them secure. These do not have to be kept refrigerated, but do keep them in an airtight container. 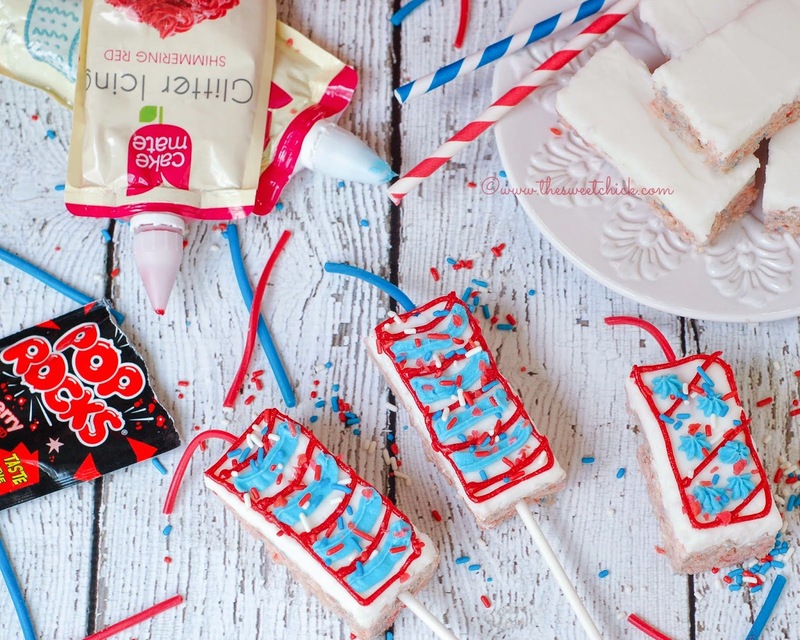 If you are making these ahead of time, don't add the Pop Rocks until you are ready to serve. Frosting Recipe from Wilton's Class Buttercream Icing .